Jerry Bread said he frequently points out the “frozen imagery” of Native American people to many non-Native Americans, even in the academic environment. Bread, founder and director of the Native American Studies Program at the University of Oklahoma, spoke at OCCC on Nov. 9. Bread said the reason such imagery exists today is the lack of education to help them break down harmful stereotypes of Native American people. “I talk about American Indian people today and tomorrow rather than always being immersed … in the past,” Bread said. With a Kiowa name given to him by his grandfather which means “one who does not retreat,” Bread said he has spent his entire life educating Native Americans and non-Native Americans about such harmful imagery. 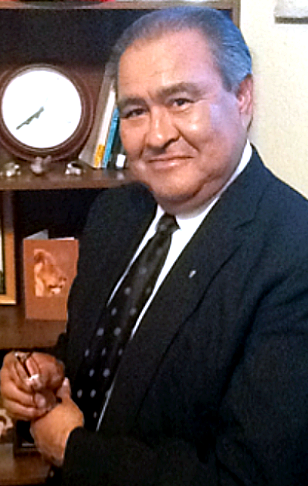 Bread said the vow he made 40 years ago that his children, grandchildren and great-grandchildren would not grow up with the same inhibition of imagery of non-Native Americans as he had to was the reason he pursued his doctoral degree which led him to founding the Native American Studies program at OU. The program offers a core curriculum of critical indigenous theory and methodology, he said. Students can then choose areas of emphasis such as indigenous media and arts, tribal governance and policy, or language, cultural knowledge and history. He said the program offers bachelor’s and master’s degrees. It’s a chance for Native Americans to learn about their lineage and culture which, he said, is fascinating. Bread said the contemporary setting of Native American people in Oklahoma is a very mixed lineage — confused and diluted. Bread said he takes issue with the U.S. government describing Native Americans as a race. Bread said he is a member of the Kiowa tribe, which is a sovereign nation — not a race, but instead a political entity with a relationship to the federal government. “The relation is nation-to-nation not race-to-race,” he said. For more information on the Native American Studies Program, contact the GET Office at 405-682-7521.